It is HALLOWEEN my freakish audio fan folks, and to celebrate we have a positively gushing font of blood and chills this year. 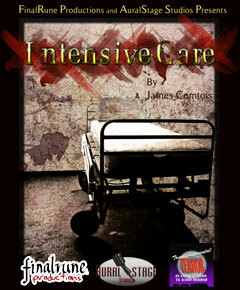 Fresh off the mixing deck, I’m proud to release the new collaboration of Aural Stage Studios and FinalRune Productions – Intensive Care by James Comtois. The show involves Alex, a young man who finds himself in a run-down New England hospital following a car accident. Strange conversations from patients and staff make Alex realize that no one ever seems to make it out of the hospital alive… time is running out for him to make his escape. And where the hell is his girlfriend Elizabeth? Following this spooktacular new work, we have another special treat: from the special collection of Richard Fish, we have an episode of Sci Fi Channel’s gone but not forgotten Seeing Ear Theatre (wonderfully eulogized by SFF Audio). The show, written by none other than J. Michael Straczynski and starring Steve Buscemi, is called “The Damned are Playing at Godzilla’s Tonight,” which asks the essential question… What IS it truly worth sacrificing to live out your dreams? We also give a shout-out to our much-loved producer David Accampo of Wormwood, who is working on a new graphic novel called Sparrow and Crowe. Listen, and shriek! A special bonus Episode 250 goes with today’s trick or treat.